Lovely, clear, warm, winter morning, temperatures in the tweens, a public holiday…. What does an average teenager from a local Basti do, on a day like this in Delhi? To my surprise I found out that he heads out to the local pond or lake. With a loaf of (local bread) Pav, a nylon twine, a fishing hook and some earthworms, he is all set to spend a lazy afternoon away from the Basti and yet be well fed at no extra cost. The fish he gets, if small is used as bait. The big fish is roasted on open fire of twigs or eaten raw along with the Pav. Sounds like a great day out right? So my curiosity aroused and I surfed the internet. 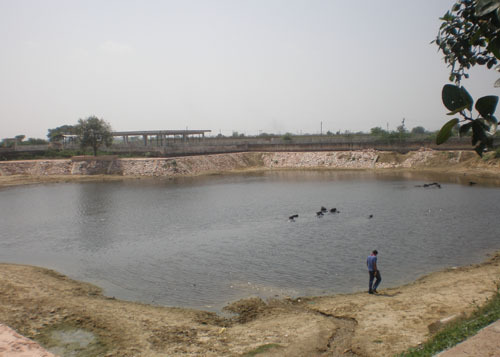 After all we all talk of Clean and Green Delhi, surely these lakes ponds would be listed and plus there is Yamuna and plenty of ground water so these water bodies do not dry completely. To my surprise while Hyderabad boasts of 263 lakes protected by the state Delhi has five lakes listed. No location wise listing of Yamuna or Ganga or its tributaries, canals that allow for green spots. While a casual visit to the vicinity of water body near my residence and other places, show that the water fronts and water bodies, however small or big, are an integral part of the local culture and very people friendly spaces. Here migrant Bihari farmers farm for up to 8 months and grow fodder and flowers, local fishermen fish, Dhobis routinely wash clothes. Herds’ men take buffalos to sit in the collected water and bathe them before returning home. These are all forming an integral part of the culture, ecology and the environment. Just in my neighbourhood within walking distance there are at least seven water fronts. But only one among them, Sanjay Jheel is listed in the Gazetteer.